This is a single screen. They come in sets of 7 or 8 ranging in screen size from 11 to 19. This is the size of the green bean, in most cases, on average. Mouse over image for lager view. Colombian Supremo's, for example, are screen 17 and 18 and nothing below. Your roaster has be certain that this basic quality point is maintained. 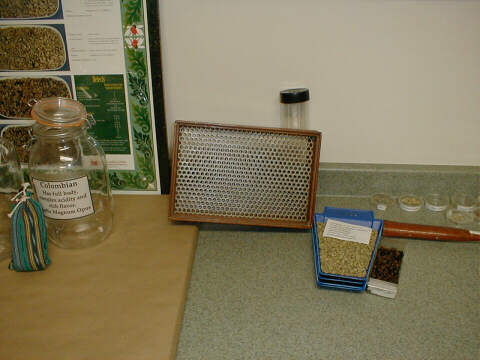 Also in the picture is a sample of Mexican Estate Coffee ready for the sample roaster and a mason jar on the left.